National Insurance Company Limited (NIC) is the oldest general insurance company in India and it is a part of 4 subsidiaries of General Insurance Corporation of India owned by the Government of India.NIC’s headquarters is in Kolkata. Being one of the subsidiaries owned by the government, National Insurance Company provides some exclusive non-life insurance like two-wheeler insurance, car insurance, health insurance, rural insurance, industrial risk insurance, commercial risk insurance, and personal insurance. It has a large customer reach and provides best customer service that is compliant with the new-age technology. As one of the oldest general insurance companies in India, NIC has been a pioneer of many changes in the insurance sector. National Insurance Company offers both third-party and comprehensive two-wheeler insurance policies with great offers and benefits, along with customised additions to the policy. Understanding the daily commitments in their customer’s life, NIC offers long-term two-wheeler insurance options for 2 and 3 years. It also provides some additional optional covers for comprehensive policies like zero-depreciation cover, pillion rider cover, no claim bonus cover, etc. Information and Facilitation: National Insurance Company Limited, Head Office 3, Middleton Street, Kolkata - 700071. Head Office: #3, Prafulla Chandra Sen Sarani, Middleton Street, Kolkata - 700071, West Bengal. National Insurance Company has a larger reach amongst the insurance companies and has branches in almost every location across the country. Hence, you can visit the nearest branch near you to address any issue regarding policy purchase, information about other products, claims, cashless facilities, etc. You can either search for the nearest branch on the official website of the insurer or contact the customer service to know more. You can also visit the Information and Facility Center at the above-mentioned address. 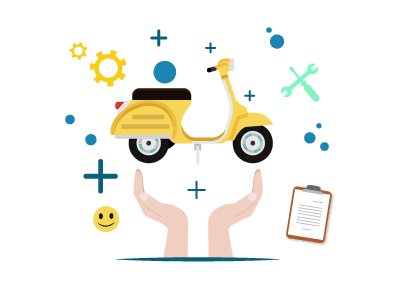 Two-wheeler insurance or any other type of insurance offered by National Insurance Company can be purchased or renewed online. You can visit the company’s website to raise a claim or get reimbursement on your policy through online facility. You can also visit the insurer’s office at your nearest branch and process your claims or any other requests very conveniently. The customer service is available 24/7. You can contact the customer care centre for cashless claims or other services like roadside assistance, accidents, etc. If you are still browsing for best two-wheeler insurance policies, then National Insurance is one you should consider. The company has a wide presence and the customer service responds to queries within a day. For further information, you can visit the insurer’s website.